Homeowners on the lookout for screen enclosures in the Minneapolis, Minnesota, area, can turn to the trusted professionals at U.S. Patio Systems and Home Remodeling. We sell and install top-of-the-line screen rooms that can turn underutilized porches into comfortable places to relax or entertain in. When you turn to us for your screen enclosure, you can rest assured that you will receive a top-notch product that is durable and low maintenance, so you can enjoy your new home addition for many years to come. • Cathedral – With high vaulted ceilings, this style screen room creates an area that feels extra spacious and roomy. The vinyl sashes of this screen enclosure will protect you from harmful UV rays and bothersome insects. Plus, a thermal ceiling will help keep the room cool, so that the sun’s heat won’t ruin your day ever again. • Studio – This style screen room will complement the look of any home. Similar to our other style enclosures, this design also comes equipped with vinyl sashes that block UV rays and bugs, as well as a thermal ceiling to keep the room cooler during the warmer months. Down the road, if you desire to fully enclose the space, our specialists can help you convert the room into a sunroom. All of our screen enclosures are built so that they can easily be transformed into a sunroom in the event a homeowner wants such an upgrade. 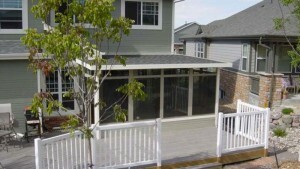 Contact U.S. Patio Systems and Home Remodeling today to learn more about the screen enclosures we offer to homeowners in the Minneapolis, MN, area. One of our knowledgeable associates is available to answer any questions you have and can tell you more about all of the excellent products and services we have available.